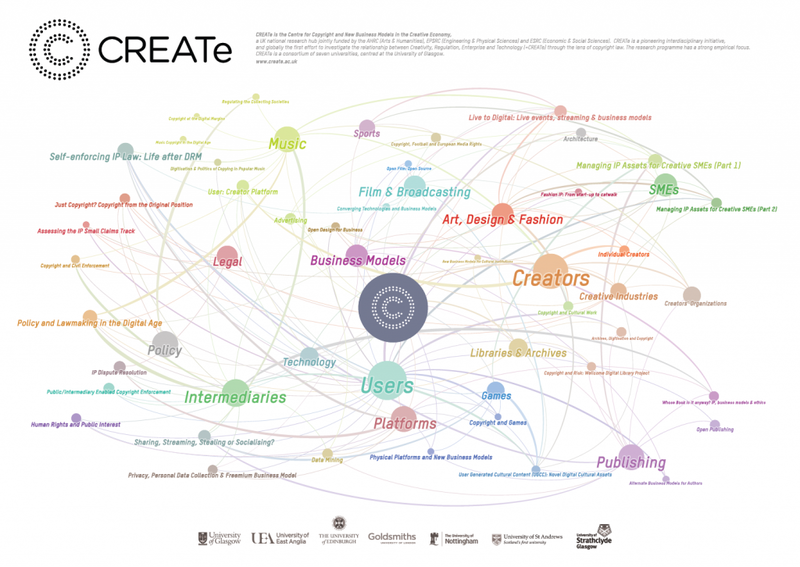 CREATe is the UK Copyright and Creative Economy Centre, based at the University of Glasgow. From 2012-2018, it was funded as an RCUK Centre jointly by the Arts and Humanities Research Council (AHRC), Engineering and Physical Sciences Research Council (EPSRC) and the Economic and Social Research Council (ESRC). From 2018-2023, it is leading work on Intellectual Property, Business Models, Access to Finance and Content Regulation as part of the AHRC Creative Industries Policy & Evidence Centre (PEC). CREATe investigates the future of creative production in the digital age, and in particular the role of copyright. The Centre brings together an interdisciplinary team of academics from law, economics, management, computer science, sociology, psychology, ethnography and critical studies. The initial consortium included seven UK universities (Glasgow, East Anglia, Edinburgh, Goldsmiths University of London, Nottingham, St Andrews, and Strathclyde). The AHRC Policy & Evidence consortium is led by Nesta, and includes Cardiff University, The Work Foundation – Lancaster University, University of Manchester, University of Newcastle and University of Sussex. CREATe has funded projects across the UK (including at Bath Spa, Bournemouth, Cambridge, City, Oxford, Kent, Leeds, Queen Mary University of London, Queen’s University Belfast) and works with over 80 industry, public sector and civil society partners. It is now one year on since CREATe was launched to high expectations in the Hunterian at the University of Glasgow. The digital revolution has moved copyright law to the regulatory centre of the creative industries. For investors, copyright has developed into a currency; users struggle with rights clearance (or ignore rights altogether); creators seek ever new ways to the market. It is a world of believers and non-believers. We hear wildly conflicting claims about the value of intangible assets, about the benefits of open and closed models of innovation to firms and society, about the potential of massive collaborative projects (wikinomics), about the impediments that existing copyright arrangements pose for new derivative markets (mass digitisation, translation services, social media), and about the link between unauthorised consumer activities and lost sales. It is a particular challenge to establish a research centre in such a contested environment. The more urgent an independent approach becomes, the harder it is to achieve. Where myths and anecdotes rule, may transparency help? At CREATe, we are taking great care to expose our methodological approach and research designs to early scrutiny by academics, as well as industry and policy users of research. We document our major events scrupulously (we have welcomed close to 1,000 delegates to 20 events during our first year); we disseminate our research as working papers (15 as of March 2014); we have contributed to 9 consultations and policy interventions; we run digital resources on our website (visitors from 149 countries). The UK has probably the largest creative sector in the world relative to GDP, accounting for over 6% of the overall economy and contributing around £60bn per annum. CREATe will examine the business, regulatory and cultural infrastructure of the cultural and creative industries by exploring cutting-edge questions around digitisation, copyright, and innovation in the arts and technology. CREATe is based at the University of Glasgow, leading a consortium of 7 Universities: the University of East Anglia, the University of Edinburgh, Goldsmiths (University of London), the University of Nottingham, the University of St. Andrews and the University of Strathclyde.